We search high and low for innovative and creative gifting ideas to show the people important in your life how you feel about them. Based on the northern beaches in Sydney, all hampers are shipped from our warehouse. Comprised of a team of local friendly mums, we are all passionate about food and wine. We genuinely care about our customers and want to help you achieve the perfect gift every time. My three passions in life are food and wine, travel and design. As a child, I could hardly bear the anticipation of my grandmother's Christmas visits. She would arrive with a suitcase full of presents, unwrapped. She knew how much joy I got from sitting among a pile of gifts, wrapping. I spent hours colour coordinating the wrapping paper, putting exactly the right bow in place and making each present look just right. I still get such a kick out of giving. I love searching for exactly the right gift and presenting it in a beautiful way. My love of good food and wine began as a student, waitressing in a fine dining restaurant. My time working with chefs and sommeliers gave me an invaluable education in gourmet food and fine wine. Now, I like to combine my love of all things gourmet with travel. I spend my holidays travelling in search of hidden vineyards and amazing restaurants. I have visited Italy to experience the pasta and gelato, France for the wine and cheese, Germany for the beer and sausage. In 1998, when I decided to leave the corporate world and start running my own company, Gourmet Basket was the perfect fit. 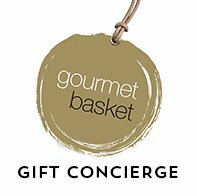 At Gourmet Basket we are foodies and gifting experts and we love to share our passion and knowledge. If you cannot find exactly what you are looking for online, our Gift Concierge will help you create the perfect gift. Using our food and wine matching expertise, we will create a personalised gift. We understand that not everyone is the same so we curate gifts for different people, different interests and different occasions, we even cater for those on a special diet. We know the pleasure that comes from the act of giving, so we want to make it an amazing experience for the giver.